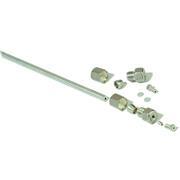 Each column blank kit includes a precision-bore polished 316 stainless steel column blank, two zero dead volume external reducing unions (internal unions with 10 mm I.D. blanks) with nuts and ferrules for 1/16 in. O.D. tubing, and two 2 μm frits. 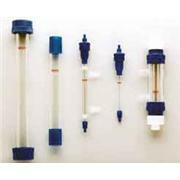 Large volume SPE reservoirs are designed to increase the head space volume of standard polypropylene SPE tubes. 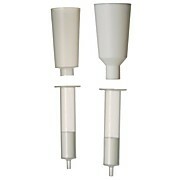 Because these reservoirs are designed to connect directly to the mouth of the SPE tube, they are ideal for gravity applicatioins where increased headspace volume is required. 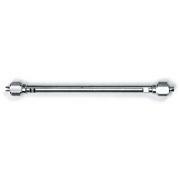 Purospher® STAR NH2 HPLC columns are amino-bonded high-purity silica columns primarily for carbohydrate analysis. The particular benefits of these columns are the very high separation efficiency and the absence of metallic impurities, giving consistent symmetrical peaks. 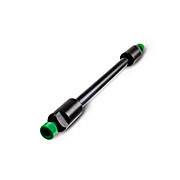 Supeltex® M-2A Packed Column Ferrule, 1/4 in. Column O.D. General Description A general purpose hydrophobic alkyl phase that is very retentive and gives good peak shape for a wide variety of compounds.